Past Aetherius Society Members..... Leaving the Aetherius Society Behind! The Aetherius Society no longer meets the standards of a True path to Enlightenment through Service. It's founder, George King, warned initiates - "you robed ones" - in the past of their pre-occupation with themselves and their spiritual shortcomings..... Since his demise, they are once more playing childish ego games which have the potential to harm others and are definitely NOT in any genuine way attributable to his original stated mission for the "salvation and enlightenment of humanity"
"Objects seen in the rear-view mirror may be closer than they appear....."
Sick of living in a white supremacist settler society in the 21st century (4,709 in Chinese Hsia calendar) ...a white racist hell-hole in the SW Pacific, uhh! SETI doesn't believe in UFO's! A doll from Belgium - now lives in Santa Barbara..... Is she the Society's own "Gurumayi" - or merely a useless silicone doll? Were any of them really from Mars or Venus or ShenXian - "the higher mental realms" ? Or were they simply aspects of the Master's consciousness? How do you prove UFO's or aliens if even SETI is a fake front for usurping peoples' computers for science research? But it is yet to be understood that the Aetherius Society was the original Earth Day cult..... and that is its main value today. The books and lectures by George King are still worth attention as he was knowledgeable and authoritative on his subject but the lectures and publications by his disciples are sheer tripe! George King - In Memorium indeed! How do you save the human race from its own blind stupidity? Or does anyone even care....? Learn to love and respect your Master instead of your own filthy egos! Or what were you there for in the first place? 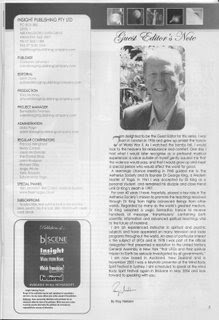 Kindly refer to the FOLLOWING EMAIL>>>> of 12th October to Ms. Samantha Moore, office manager, Insight magazine in Brisbane, Australia (http://www.insightpublishingcompany.com/) regarding certain statements made by your irresponsible bishop, Mr. Ray Nielsen, as their guest editor in February this year. I was not aware until recently that you have all now marginalised, diminished and usurped your Master's role and his life's work. If Ray Nielsen ever thought he could project into the lower astrals and achieve anything, he might have some claim to having played a "...key role...". We all know that this is not the case. I am sending this message to you to give you the opportunity to do something about controlling and disciplining your worthless emissaries. Expounding something other than the Truth will inevitably have a negative effect on the minds of all those young people who are being subtly misled into Mr. Nielsen's selfish ego constructs. That was never what George King wanted from any of you. 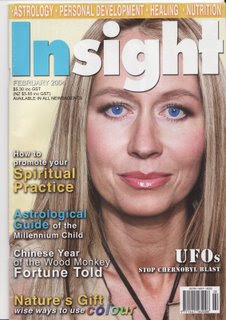 Thank you for your kind words in replying to me and your prompt response in sending me a copy of your February back-issue of Insight. Whose is the beautiful face on the cover? I noticed an article on page 32 but no information about her. Any clues? I noted with interest the articles on George King's "Aetherius Society" by Ray Nielsen and others. It is good to see that the work of a real enlightened master is still being promoted. Unfortunately, I must disagree with the statement by Ray Nielsen (editorial, p.3) that "...for over 40 years, I have.....played a key role in The Aetherius Society's mission...". That is not what he spent at least 30 of those years doing and it is only since he was made a bishop of the Aetherius "church" that he has done anything like that. I know these people and it was not like that. Nielsen was George King's personal assistant and that was all. It was always very much George King's organisation when he was alive and it was he who solely played the "key role" in spreading the teachings he received through mediumship or channelling whist in a 'positive' self-induced trance state as well as LIVING those teachings and diligently attending to whatever tasks his teachers or masters gave to him or directed him to do. No-one else was really capable of the depth of knowledge and, in those dark days of the 'cold war' global madness, the real bravery it took to competently deliver those messages of TRUTH to a desperate but ignorant world. In fact, George King could have just as easily and with much less risk to himself made himself popular and wealthy by promoting himself as "guru" this or "yogi" that as many have done. Instead, he chose to follow the path he was given because he could see that it would help the world and all people by that much and more than by merely catering to his own personal benefit. That, and the truth in the words that were spoken, proved him to be the real article in every respect. Sadly, if you look at it on their website, that portrait photo of George King which you printed has been 'colourised' more recently by his followers to give him a 'California surfie' look with blond hair and blue eyes! As you can see by the other photo you printed, he actually had black hair and brown eyes - a 'look' which is now becoming much more popular in California these days with the Latino (and Asian) influence finally taking precedence as it once was long before. Only one who can travel freely between the worlds ("heaven" and "hell") and can fearlessly meet whatever is there has that appearance. Even those Buddhist meditation masters who I have met who have had "diamond light" in their eyes, and with all credit due to them, have not had that kind of power or spiritual development. When my mother was the organiser of the Queensland branch of The Aetherius Society (in about 1960), I recall that she had once complained that the then very small Aetherius Society was in danger of becoming the "Ray Nielsen society" when he was assisting with its running while George King spent much time doing his essential work. It would seem that is also why he was more recently "encouraged" to leave their headquarters in Los Angeles and go far away to the other side of the world. Well, now I guess he can have it his way over here. It is disappointing to find that those who were fortunate enough to live for years with their master have still not given up their silly egos or whatever else is holding them back from truly benefitting themselves from his valuable guidance and teaching. Nielsen and Co seem to be only able to recount what their master has done in the past but still have not been able to put it completely into the context of the present. That is still worthwhile but it does not give people NOW what they really need. You only have to look at the healing (etheric/ spiritual) instruction video that the Aetherius Society put out a few years back to see that Ray Nielsen doesn't really have a clue when it comes to the way he was waving his hands about in that pathetic demonstration. I've seen real healers at work and not even George King would have done his hands-on healing anything like that - and they had the cheek to grizzle when I told them so! No-one can heal without demonstrating true LOVE - that is all it takes and the technique is secondary. No amount of "stage performance" (like Shamans or so-called Philipino "faith" healers) ever does anything except in the mind of those looking on and possibly the patient if they are ignorant enough. I don't know what Nielsen thought he was up to but it wasn't anywhere up to the standard one would expect from a sincere disciple of a real master. In all those years, none of his followers seem to have fully grasped the essence of what George King was doing. You would expect most of them to have attained enlightenment by now but they seem to still be proving that they haven't applied themselves diligently enough. Except for the teachings of the masters and the story of George King's achievements, any failed ShaoLin monk would be able to put them to shame. Instead, they have, for the most part, been so pre-occupied with their "position" in their church instead of going out into the world to demonstrate the power of real love in action as they were required to. George King once referred to "...you robed ones..." in a rueful lecture on their woeful failures including their apparent inability to follow the pointed advice of the ascended Chinese master who had instructed George King to found the Aetherius Society to "be kind to one another". You only have to listen to the lectures on cassette of a couple of their "bishops" to find what pointless prattling they have limited themselves to in the past instead of trying to live up to the example of their master. I hope they can do a little better than that now. That is why George King alone played the key role in disseminating the teachings and any decent student of metaphysics or mysticism would be impressed by his clear forthright lectures and vast genuine knowledge of his subject. Thanking you for your kind assistance.